Freesia is a twelve-volume manga series (adapted a live-action movie) drawn by Jiro Matsumoto. Set in an Alternate History Japan, rampant crime and dwindling resources due to a war with another nation led the government to passing the Vengeance Act to keep prisons from overfilling. As a consequence, instead of going to prison, victims of a crime can legally try to kill the perpetrator, or enlist the help of a proxy agency to have their enforcers do it for them. The target can also enlist the help of bodyguards to help defend themselves (in the event that the target can't find/afford any, the government provides bodyguards for him). Freesia follows the lives of our main cast, as well as the people that they interact with and how the Vengeance Act affects society as a whole. It's drawn with Matsumoto's distinctive dirty and sketchy art style. 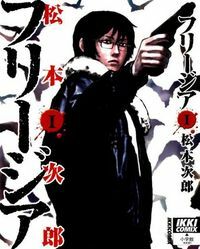 Like any Jiro Matsumoto manga, expect to see hallucinations, plot twists, and lots and lots of Mind Screw. Dead All Along: Kano's girlfriend died somewhere in the middle of the story, and he never noticed it until authorities had to remove the decaying body. Dirty Cop: Government-appointed bodyguards are very easy to bribe. Yamada doesn't like that at all. Dissonant Serenity: Kano and Higuchi are always eeriely calm. Kano begins to show more emotion towards the end. Doppleganger Spin: If somebody saw Kano when he activates his Invisibility, the person will still see an afterimage for a period of time, thinking that's the real Kano. Forever War: Against and unnamed nation, from the everyday citizens' perspective. And they're losing. By the end of the story, the government surrenders and the Vengeance Act is abolished by the occupying force. Invisibility: Kano can blend into virtually any surrounding. How effective it is also depends on his mental state. Knight in Sour Armor: Yamada, after a few missions on the field. Mind Screw: Matsumoto loves this trope, and his art style adds to the insanity. Have fun trying to pick apart what's real and what's not. Sanity Slippage: Mizoguchi. Kano slides back and forth throughout the story. Sliding Scale of Idealism Versus Cynicism: Pretty cynical, but doesn't go all the way. Unreliable Narrator: We see events happening mainly through Kano's eyes, which makes us prone to his hallucinations. Villain Episode: In Terajima's story arc, we get to see a proxy enforcement from the target's side. Wide-Eyed Idealist: Yamada at the start of the story. Goes to Knight in Sour Armor territory in record time. the characters, especially Higuchi, also qualify.